FBN created quite an upheaval in the agriculture industry in 2016 when we developed a supply chain that put the needs of the farmer first. With farm profits down and record profits for the major companies in the ag industry, we set up a supply chain focused on getting the lowest possible prices for inputs that farmers need to start their season. In 2017, we created an online shopping experience for our members with the goal of giving them all the information they need to properly evaluate their purchase. With equivalent products that have different amounts of active ingredient, farmers have to do conversions to understand total gallons needed. They also need to think about the total gallons needed to apply products at a particular rate on a specific number of acres. This e-commerce experience is a bit more complicated than shoe sizes and different colors of sunglasses. In the first month of the online store, we had farmers placing six-figure orders. This tool allows FBN members to sell their crops far more efficiently than they have been able to in the past. With FBN, farmers can quickly track bids, receive push notifications when grain elevators post a price at which they are willing to sell, and automate break-even calculations for the business after transactions. Another feature created to help farmers is the Target Price. Farmers typically watch the prices that are posted by the buyers, but they should really be factoring their costs when considering their sell price. Our Crop Marketing tool includes cost of production, transportation cost, and storage cost in both the overall breakeven price for the entire crop and in the sell prices farmers see on the market. Utilizing this different perspective can yield results that seem counter-intuitive. Some farmers find better target prices for their crops over 100 miles away after factoring in the additional transportation cost. It's another way FBN is helping farmers change their thinking. Extole is a referral marketing company that has run successful campaigns that have been directly responsible for millions of dollars in revenue for companies such as Casper, Starbucks, and Virgin America. We were taking something created as a startup growth hack and bringing it to enterprise clients as a viable way to acquire quality customers. My main project was a tool that would allow marketing teams to create and maintain referral marketing campaigns. Not only could they manipulate the overall look and feel, but marketers could create unique experiences for their customers at multiple touch-points such as emails, landing experiences, and social sharing. 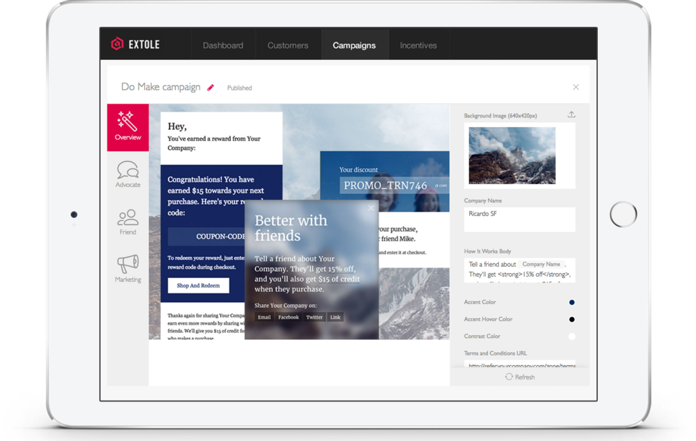 When the project shipped, clients were able to build and launch their own campaigns independently without having to rely on the Customer Success team at Extole. When FBN expanded into Canada, we needed some unique branding for this new venture. Up to that point, FBN had a strong secondary brand centered on the Farmers First motto of the company. This banding was very patriotic and was focused on an American flag style design. We wanted to create something similar to help get our new Canadian members excited about the launch. After doing some initial explorations, any design that too closely resembled the Canadian flag was a bit strange in terms of proportion and scale. Also, upon further research, the Canadian government can be quite strict about the use of the flag or the maple leaf for commercial purposes. However, they define the leaf as having 11-points. So, by tilting the leaf and cropping it, it was no longer an 11-point leaf, and the design had a more unique look. 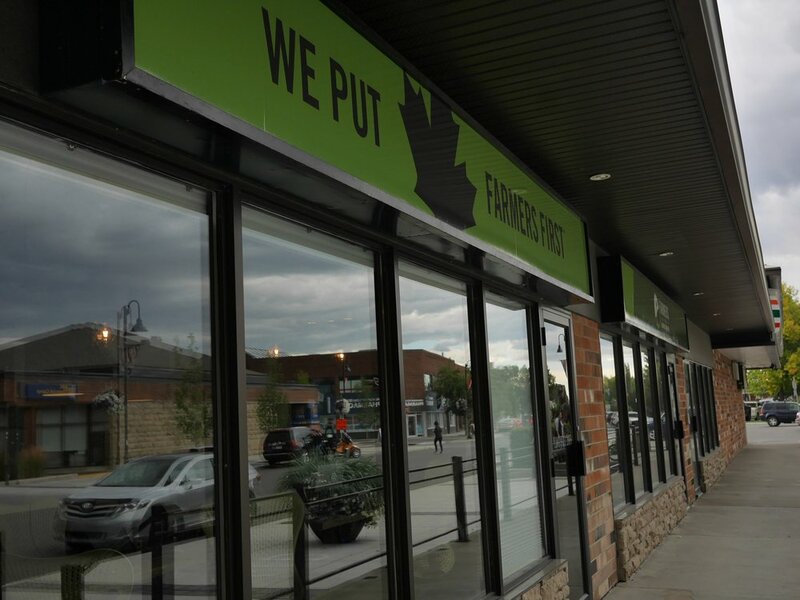 The design was widely adopted by members of the FBN Canada team and it has appeared on everything from sweatshirts to storefront signs that I also designed.